Keith Lango Animation: "Our jobs"
Furthermore at the panel discussion, some wondered what will happen as India and South Korea (and others) gear up to build strong animation industries. "They're going to take our jobs," many worried. I say, that's only possible if there's such a thing as "our jobs." I argue that there is NOT. There are no agreed upon jobs that are ours for the taking or that can be reserved for us like a rental car. Not on an individual level, nor a city-wide level, nor a national level. We have to reach out for those jobs...to create them ourselves. There's no such thing as entitlement. Just because we decided to be journeymen animation artists doesn't mean the industry owes us squat. This can be empowering if you let it. That's how I think. Who can say I'm wrong? It's my view of the universe and it holds true in my own head, and it helps me survive and navigate this difficult industry. 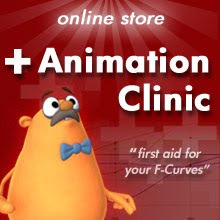 I have had the unique pleasure of having many students from around the world taking part in my APT online animation training program, as well as benefit from my video tutorials in the VTS. Occasionally somebody asks me about my feelings regarding training folks over seas to take 'our jobs'. I've usually replied "Who said that only westerners can have animation jobs?". Nationalism is a dangerous mindset often found at the root of many evil deeds. Americans lament that over 4,000 US servicemen and women in the armed forces have died in Iraq since 2003. Most Americans haven't spend two seconds of thought over the 80,000+ Iraqis who have died as a direct result of our making a mess of their land for no justifiable reason. This parochial value-ism is immoral. A person is a person whom God made and that's that- no matter where they live. By my way of thinking I don't see the life and career of an American animator as having any greater or lesser value than an animator in Singapore, Mumbai, Seoul or Beijing. Both are human beings, both have hopes and dreams, both love what they do, both want a chance to succeed and-- if they are of suitable skill & talent for the tasks available to them- both can and will succeed. If you can't compete on price, then it's your job to provide value (tangible and intangible) that cannot be matched elsewhere. This requires you to be creative, to think, to grow and improve, to find new ways of getting things done. If the dinosaurs step left, then be nimble enough to know how to scamper to the right. The world is never static and nobody ever promised that everything will stay exactly the way you like it to (oh, how I wish it would have sometimes!). Adjust with the world or get left behind, because the world is not going to stop just because you're comfy with where it is right now. So by your argument, the onus is still on the 'Western' economies to innovate products that can be exported abroad to be then produced. Does this stimulate these countries to create product themselves, or just do the work by having a cheaper workforce? Why should a country invest in R n' D when the eventual social benefits of such go somewhere else? I think that we do all have access to jobs. If you have the experience and the drive, you can start your own studio or projects and tell the stories or make the games that people will want to buy. @dan: I disagree. I don't think your conclusion extends what Keith wrote. We live in a world where "R n D" - or production of knowledge - is done in countries other than the US. It is not just a matter of workforce any more. It could sound weird, but people in other places are also able to think and produce original things. Think anime, for a pretty obvious example. I personally don't like the style, but that's no way to deny good bits of originality and technical avant-garde in some productions. If only poor quality (technical and story wise) animation is done overseas, nobody in the US should to be worried. The competition is no longer in refinement of drawings. Once again thanks for supporting us.. I don't think it has anything to do with Art, Culture, recognition of 'Humanity' or whatever. It's a function of Capitalism - the bottom line, the greatest reward for shareholders. That's the generator that turns the fan, that blows the wind that tosses us all around. "Most Americans haven't spend two seconds of thought over the 80,000+ Iraqis who have died as a direct result of our making a mess of their land for no justifiable reason. This parochial value-ism is immoral." What's immoral is this kind of constant misrepresentation of the facts. Invading another country, paying off the families of fanatic psychotics, testing biological weapons on innocent civilian population centers, and firing on a military guarding a UN sanctioned no-fly zone are more than enough to justify invasion. The kind of thinking that leads to statements like 'no justifiable reason' are not only ridiculous, but when held up to history they're downright stupid. I think you have forgotten about one thing Keith. The biggest purpose of moving jobs (be it animation or whatever..) to Far East countries is greed. People down there are paid less - people from the west are, well not paid, because there are no jobs. Nobody wins (on regular worker level). Personally I give it 5 to 10 years and 3D animation will go the way of 2D..
People complain about jobs going overseas all the time, but I don't think it's right to accuse them all of jingoism. Perhaps they're not complaining because they think foreigners are less deserving of jobs, but simply out of fear of losing their own jobs. Prejudice has nothing to do with it. Everyone's just trying to earn a living. Keith, reread what you just wrote. You compared complaining about losing your job to not caring about the death of tens of thousands of people. Personally I think my problem with the whole thing is that US companies are more than willing to send jobs overseas or to Canada, sacrificing the country's workforce. Whereas other countries will tend to protect the workforce they have and not hire foreign workers. I'm using Canada and Europen countaries an an example here. The US doesn't really value it's workforce. Not just in animation, but in other industries as well. They're rather keep it in the black than keep people employed. @Paul: Actually I was trying to point out that viewing the world through a parochial, nationalist lens often causes people to de-humanize others from different lands and cultures. An innocuous example being that an "American job" is of greater value than "a foreigner's job", the most extreme example being that an American life is of greater value than a foreigner's life. Same point of view, just the two ends of the intensity graph. I find people's reactions intriguing. The point of the post isn't that it's good or bad that animation work is going away from American locales, or that wars are good or bad or that business is good or bad, etc. The point of the post is that people everywhere are people just like you and they also should have a chance to succeed doing what they love to do. The second point is that the world is flowing the way it's flowing whether we like it or not and complaining about it is of no value. Folks seem to be focusing on the politics (a waste of time) or the economics (tipping at windmills), while ignoring the primary call to action- step up your game to remain relevant. It's always going to be easier to get upset at businessmen, foreigners or me than to turn that view inward and examine where we can improve our own offerings in the animation marketplace as individuals. Sorry if it came off that way. if there were two Michelangelo's would you hire the one living in America expecting retirement and health insurance, or would you hire the one who is hoping for just $20 a day? Stepping up your game becomes a moot point once you've maxed out your skill level. Once you're feature film level, is there really such a great difference in skill level up there that an employer would be willing to pay 10 times more? And since the competition is so fierce, stepping up my game basically comes down to practicing every free moment I have (your opponent trains while you sleep) which is not acceptable because my kid needs a Dad around in the few hours I'm not already working. No offense taken, Keith. And of course I agree with your main point that people are people no matter where they live (to paraphrase Horton). And that a hardworking animator in Manila deserves a chance to earn a living the same as a hardworking animator in Redwood City. I also agree that complaining is not the answer - the answer is to adapt and stay competitive. I just disagree with the implication that animators dread outsourcing for jingoistic or prejudiced reasons, versus anxiety over paying rent. In regard to the above post by AES, I love the idea of people in countries all over the world working on local productions that are targeted at a local audience. Not only would there be more jobs, but we'd have a much more varied body of films to enjoy. The idea of people in countries all over the world working on local productions might sound romantic, but consider my country of 6-7 millions vs the US. For every person in my country there are 50 people in the US. That means 50 times the revenue potential. That means that as a producer, to invest in a movie that is local to my country with our specific culture and language, and to make the same kind of profit as in the US, he would have to invest 50 times less money. Which either means really cheap animators (wages here are lower, but not THAT low), or less animators, or less time to work on the movie, which all boils down to much lower quality of the final product. The idea of competing with outsourcing by "stepping up the game" is completely irrelevant as it addresses the wrong parameters: The workers in India or everywhere else in the world are not generally better animators than the US animators - they are just cheaper. Quality is not really a parameter here - and even if it was, it's not fair that every animator in the US has to be top-notch to be able to compete with an average animator in India. Excellent point. I hadn't thought about it like that before. You're totally right.